Longsong is a shoo-in for a truth-in-naming award. The idea for a bar above Little Bourke Street's Longrain has been on the song sheet since the modern Thai joint opened in late 2005, and in the 14 months since owners John and Lisa van Haandel persuaded chef David Moyle from Hobart's Franklin to join the team, the volume's become thunderous. For anybody who keeps track of these things, it's not just been a long song but an epic one. The anticipation has been exhausting. Is it wrong, then, that like an overexcited shopper bursting through the doors at a Boxing Day sale, I'm in Longsong mere seconds after it has opened? A fresh paint smell is mingling with the smoke from the open kitchen's only cooking apparatus: a wood-fired stove and grill. Some furniture is yet to arrive. The tight menu ends with the words: "more to come …". But still. It might not be fully ready but I am. Obviously. The room is superb. Part of a circa-1900 stables building, Longsong has soaring walls capped with a pitched roof and support beams hung with massed light fittings that mimic the oversized paper lanterns released during full moon parties on Thai beaches. Their bulbs flicker like candles. Corny? Maybe, but they work a treat. 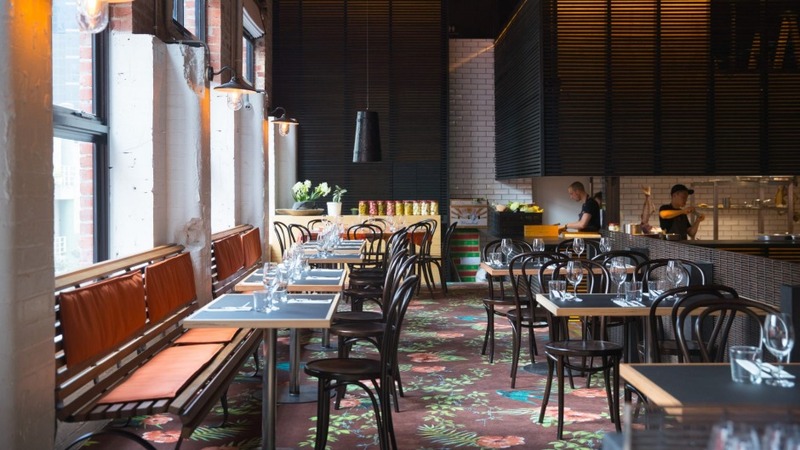 There is slatted, backlit timberwork that scales the walls and wraps the bar. At the front, overlooking Little Bourke Street, large windows can concertina open on warm nights and make it feel like you're outside. The uneven floor, bricks from the original stables, has grooves worn into it from the horses' hooves. There's a raised, carpeted dining area where Moyle plans to serve a more thorough dining menu down the track but for now, Longsong is sticking to the original plan of being sister bar to Longrain's restaurant. The opening menu is snack-focused and you order and pay at the bar, though there is table service in the 30-seat dining area. There's a Thai influence here but you'd never call it a Thai restaurant. Head downstairs for that. Here, it's more about the seasoning, the approach, the smoky waft of street food than anything literal. Wapengo rock oysters are heated in their shells over coals so they're warm through, their overt brininess pushed to the fore. They're served with a wedge of grill-striped lime that adds a whack of tang to proceedings. Superb. Raw snapper served with creme fraiche, mustard oil and pickles promises more than it delivers. The texture is good but the seasoning lacks. On the other hand, a dish of char-grilled, smoke-licked fresh peas tossed with chicory, lovage and a sweet onion dressing delivers more than it promises. There's an impressive dish of thin potato noodles, a relative to Aaron Turner's dish at his Geelong restaurant Igni. 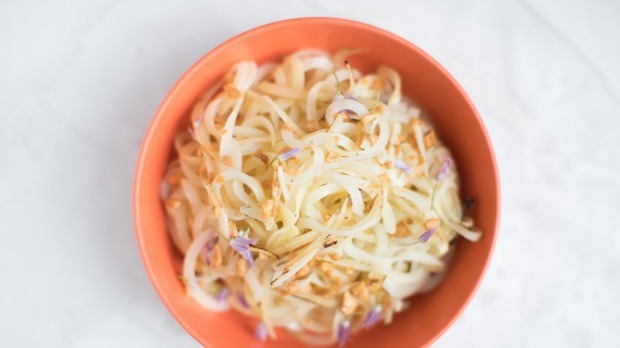 The "noodles" (potato, not potato flour) are cooked to a crunchy al dente, flavoured with garlic and scattered with purple society garlic flowers. Moyle adds smoked bone marrow, adding some rich fattiness to the mix. 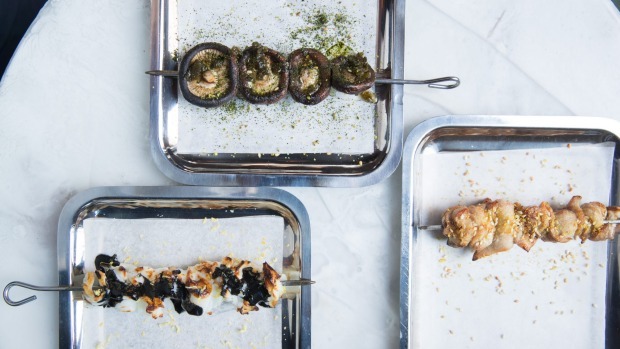 Skewers ("sticks") might come loaded with tender calamari blackened with a squid ink sauce, pieces of perfectly cooked chicken thigh with a rendered chicken skin and chicken fat glaze, or a robust shiitake mushroom and kelp number. They'll become Longsong's go-to dishes. Large feasting dishes of fish, bird and beast are there for those with mates or major hunger. 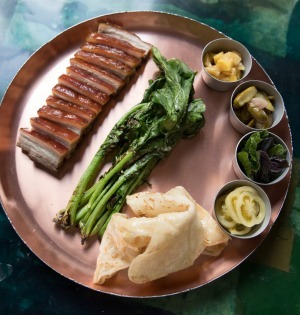 Pork belly arrives in neat slices on a round metal tray with sides of pineapple, vinegared green tomatoes, shallots, soft herbs, charred gai laan and crisp roti. The flavours are good, clean, smoky, but request some of the superb fishy house-made XO sauce or gochujang-style hot sauce and your night will get a whole lot better. It was probably pretty good already if you'd taken advantage of the cocktail list that includes three spritz cocktails made with house-infused vermouth and garnished with fresh lemon thyme. The wine list, courtesy of wine guy Mike Bennie, is short, sharp and fond of small Victorian producers – an unfiltered Ephemera vermentino from Heathcote, a Billy Button nebbiolo from King Valley – while also making room for Heidsieck champagne or negroamaro from Puglia. There's good Victorian stuff in the barrel, too, served by the glass, half-litre and litre. Dessert-wise, Moyle is dabbling with a sparkling shiraz spider that's exactly what it sounds like – purple frothy fun – or perhaps a grilled mango cheek, caramelised and perfectly matched with shiso leaves and vanilla yoghurt. Longsong is a pup but it already shows signs of knowing a good time. The room, a Melbourne classic in the making, helps. As do the staff who keep it loose and humorous without stinting on the efficiency. With food that hits the bar snack sweet spot of interesting and booze-friendly, Longsong is already proving itself worth the wait. Roll on week two. Pro Tip: Want to be sure of a seat? The "dining room" takes bookings. Go-to Dish: Chicken skewer glazed with sesame-flavoured rendered chicken skin, $8.